My sister got the cheaper competitor doll. It had a similar face and talking device. It was called Charmin' Chatty. And it peed. Copyright infringement battles wiped it out. 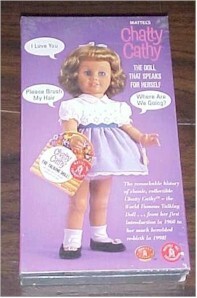 My baby sister got a Chatty Cathy doll that--when you pulled the string--it was all unintelligible jibber-jabber. My older sister solved the mystery: the doll was speaking spanish! I wanted a chatty baby doll so badly. It was expensive, but my parents sacrificed to get me one. I got it on Christmas eve. She said several things when you pulled her string, one of which was "night, night". Well at bedtime I tried to get her to say "night, Night" , but no matter how many times I pulled the string she just wouldn't! I went to bed dissappointed. The next morning all she said when I pulled her string was a Purr sound! Another set of parents might have returned her. Mine didn't, but it taught me a valuable lesson. Everything we desire is not neccessarily what is good for us.